Throughout the ages, ancient civilizations have left their footprints in Jordan. Reminders of the Silk Road which linked the regions of the world in commerce. Ancient cities, such as the Romans’ Jerash and the Nabateans’ Petra. Significant religious sites, like Mount Nebo and the River Jordan. And, to this day, we continue to discover such footprints. With Google Street View, would-be visitors, or those just curious to learn more about our ancient lands, can explore Jordan’s unique historical heritage online. That’s one of the reasons I love this technology. Not only does it connect millions of people from all corners of the world, it provides a lens on the past. And when we understand more about each other’s stories and cultures and histories, we realize that we are more alike than we are different. That’s why we must preserve these treasures for future generations. They’re a doorway to our shared narrative. To this day, after too many trips to count, Jordan’s ancient archeological site, the Rose-Red city of Petra, still fills me with awe. Concealed in majestic mountain gorges, visitors can wander through the entire city of Petra, imagining what life was like in the thriving trading center and capital of the Nabataean kingdom. Carved by hand into vibrant red, white and pink sandstone cliffs, it has, miraculously, survived earthquakes to withstand the test of time. Film buffs might recognize it from Indiana Jones and the Last Crusade when Harrison Ford and Sean Connery joined forces in their quest to find the Holy Grail. Now, you can step back in time and take a narrated tour of this hidden gem, exploring the tombs, sites and amphitheater that span an area the size of lower Manhattan. Jerash is the second most visited site outside Petra. It’s considered one of the best preserved examples of Roman architecture outside Italy. With one click, you can stroll through its ruins, walk its streets, sing in its theaters and contemplate life in its baths and temples. Before you leave, remember to send a message through the city’s ancient whispering columns! Mount Nebo, located 10 km west of the Roman Byzantine town of Madaba, is one of the most revered holy sites in Jordan. 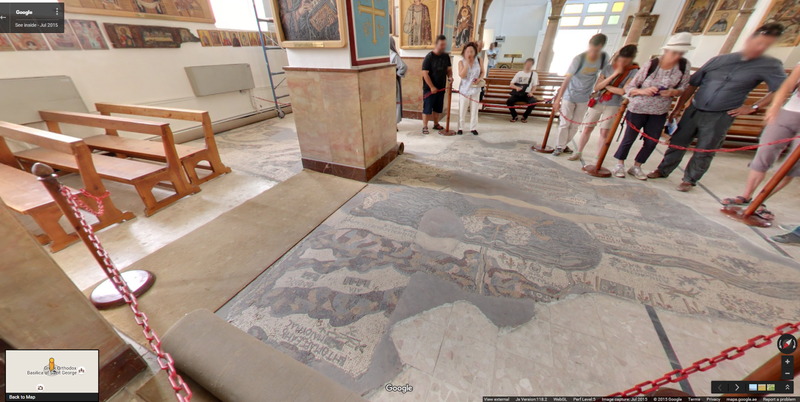 While you’re close to Madaba, step into its historic church to view the Madaba Mosaic Map, the oldest known geographic floor mosaic in art history. The Madaba Mosaic Map, created in 6th century AD, originally contained more than 2 million tesserae! What could be more relaxing than a float in the world’s saltiest waters? A visit to the Dead Sea, the lowest point on earth, is known to be a very therapeutic experience, thanks to its oxygen-rich water and mineral-mud. While you’re exploring, don’t be surprised if you find a medieval castle right in the middle of the desert. We’ve got many—from crusader castles like Al Karak, to Ajlun Castle built by Saladin, to Umayyad desert castles Qasr Amra and Qasr Al Kharana. Jordan remains a haven of peace and moderation in the Middle East. So, please, come and visit us. Meet and talk with our warm and hospitable people. Taste our cuisine. Learn some Arabic. Relax in the therapeutic waters of the Dead Sea and the Ma'in Springs. Marvel at the rich colors of Wadi Rum, the spectacular desert backdrop to "The Martian." Walk in the footsteps of our forebears. There’s so much to see and experience. There’s something for everyone in Jordan. And I couldn’t be happier that now, thanks to Google Maps, we can share our rich cultural heritage with the world. Visit g.co/Jordanhighlights to start your tour. As we say to all our visitors: ahlan wa sahlan. Hello and welcome. 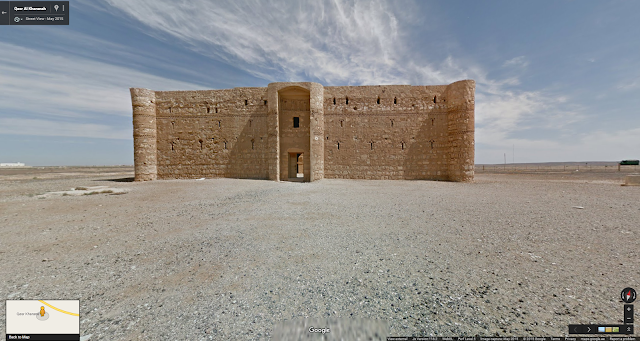 Starting today you can explore more than 30 historical sites throughout Jordan in Google Street View. To tell you more, read today’s guest blog post, by Her Majesty Queen Rania Al Abdullah of Jordan. -Ed.